More Test-SISI, Tone Decay, Warble Tone, Auto Threshold. Maskings: Narrow & Speech along with Wide band. A separate toggle switch for left & right channels. Pulse Tone key & +20dB key on ‘Audiometer’. Built – in memory for 500 Audiogram report to recall them later. USB port for computer adaptability and to operate through computer. 2 way communication. (Software provided). Noise : Wide, Narrow & Speech Band. Standard Headphones : Supplied with HD-01 as standard, can accept both 8 and 10 ohms headphones. 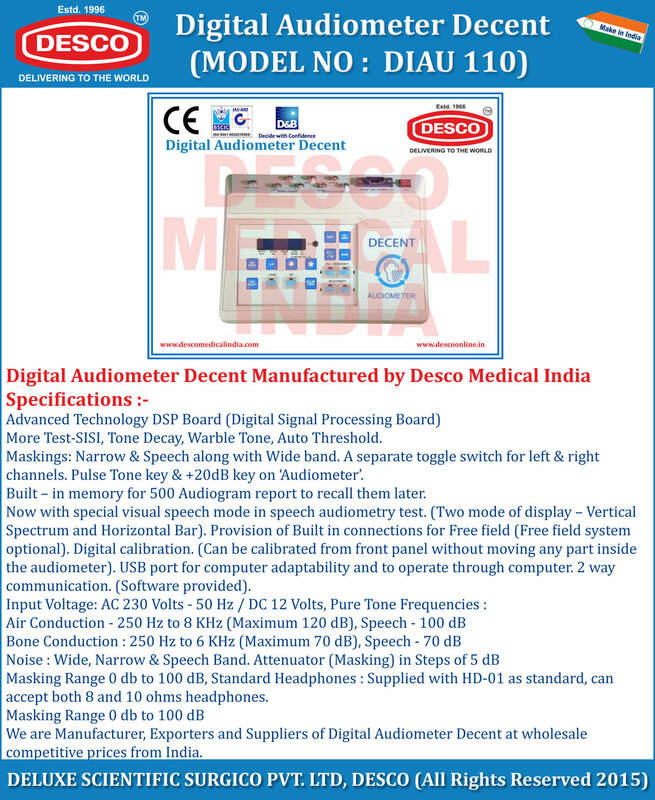 We are Manufacturer, Exporters and Suppliers of Digital Audiometer Decent at wholesale competitive prices from India.